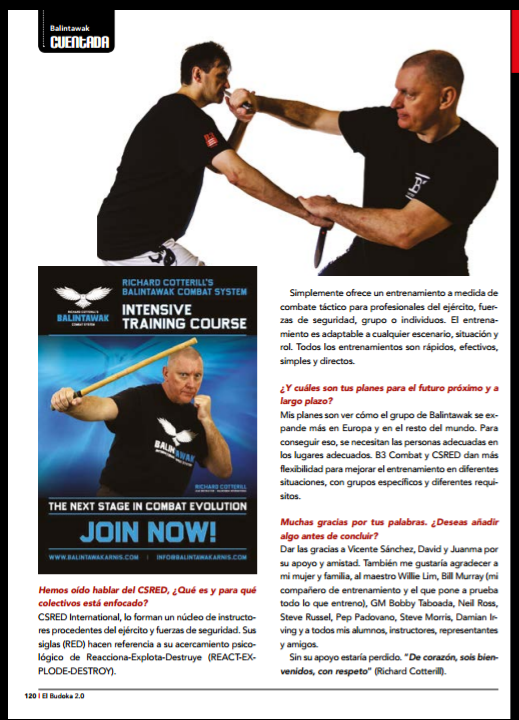 To those who have the privilege to meet and train on first-hand with the European Chief Instructor of Balintawak Cuentada, Richard Cotterill, we don’t stop of getting amazed that after 45 years training Martial Arts, and more than 25 Filipino Martial Arts, he continues being thrilled like his first training day. 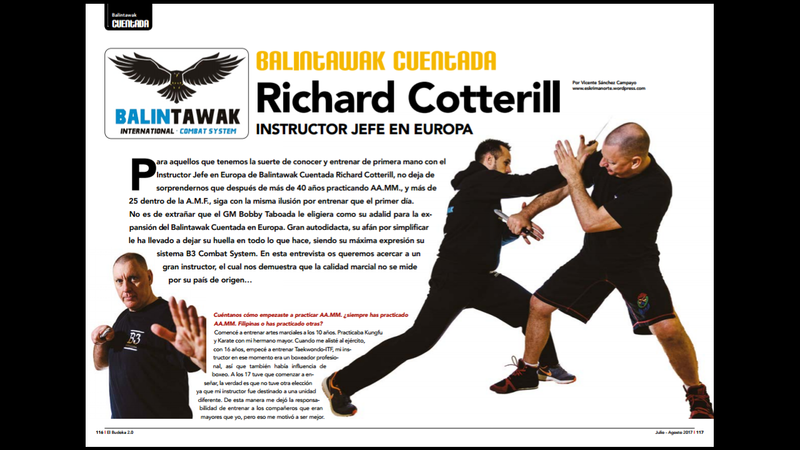 No wonder why, GM Bobby Taboada chose him us his head instructor to expand the Balintawak Cuentada in Europe. Great self-taught, his desire to simplifying led him to leave his mark in everything he does, being his highest expression his B3 Combat System. I started training martial arts at 10 years old initially in Kung Fu and then Karate with my older brother. When I joined the UK Forces at age 16 I began training ITF TKD, my instructor at the time was also an amateur boxer so there was some influence of that. At age 17 I had to start teaching, had no choice really because my instructor at the time was transferred to different unit. He left me with the responsibility of training guys that were my seniors in age but that inspired me to be better. Long story short I learnt some basic Balintawak on a trip to the USA in 1992 whilst training bunkai (application of kata) with Willie Lim. He was a good friend of Bobby Taboada when they were both previously living in New Zealand. My first steps were very difficult because we returned to UK with only 2 video tapes of Taboada Balintawak and no instructor. So I was self taught initially. No prior knowledge is needed, in fact sometimes those with prior martial arts knowledge it can be an burden to learning because set patterns, restricted thought processes and stylized sequences are already indoctrinated. It is all about perspective and understanding that just one true concept of combat is more valuable than multiple styles and a multitude of techniques. The term “Martial Arts” to me means a “Warlike expression of yourself”. Basically it is about violence. If you want to think about meditation, waterfalls and all things spiritual etc. then you’ve probably been inhaling too much herbal smoke in a dark room. Fighting is about someone that wants to kick / punch or stab the living crap out of you. So what are you going to do to stop that. 95% MINDSET and 5% TECHNIQUE! Within the system, are you only focused on teaching stick? I always explain to students I don’t teach stick. Only empty hand with a stick held in it. The reason I use that explanation is because I do not want the practitioner to think about the stick or any specific weapon. A weapon is only an extension of the limb / hand. 6.We know you give seminars all around Europe, What countries are you teaching currently? And what about Spain? So the countries I am presently represented and teaching in are: Austria, Belgium, Canary Islands, Czech Reublic, England, Hungary, Italy, Luxembourg, Poland, Russia, Scotland, Slovakia, Spain, Sweden, Switzerland. Spain is a very special part of our group. I have seen it change over the years but it is only as good as the person that leads it. I thank my instructor and close friend Vicente Sanchez and all of the team especially Davide and Juanma for that. He has an amazing group of guys. I would also like to mention my team in the Canary Islands, they have also for many years supported what I do. Tomas Encinoso is the head of the group there and is another great instructor and friend. Could you explain to us what are your working on or which are your projects currently? Well after many years of being asked for a curriculum for the B3 combat system I have decided to put time into structuring that. That’s not easy for me because I am a big believer in inventing it as I do it. For example I have to be very careful not to fall into the trap of situation A requires type B response. B3 is a combat system based on BATON – BLADE – BARE HAND BOXING It is driven by a methodology and perspective that you need to create physical and mental pressure to make mistakes thereby learning how to rapidly adapt to meet and resolve those training and confrontational challenges. It requires a mindset not based on specific techniques but on core ideas that are related to meeting fighting objectives. We have listen also about CSRED, what is it? Who is it designed for? It offers simple, bespoke close quarter tactical training to professional military and law enforcement organisations, teams or individuals. The training is suitable for any environment, situation or role. All training is fast, effective, simple and direct. What are you plans for your short and long­term future? My plans are to see the Balintawak group expand further throughout Europe and the rest of the world. To do that it needs the right people in the right places. B3 Combat and CSRED give further flexibility to enhance training in different environments, specific groups and requirements. Without everyone’s support I am lost.